There is a "compelling" case for road charging in the UK rather than the current system funded by taxes on fuel, a study has suggested. The report by the Institute for Fiscal Studies (IFS), funded by the the RAC Foundation, suggested a "radical overhaul" of road taxes was needed. 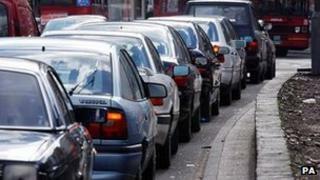 Fuel and Vehicle Excise duties raise about £38bn a year but are set to fall. The Treasury said possible new ways of funding roads would not involve tolls or pricing on existing routes. It added that revenue from duties was currently rising. Forecasts from the Office for Budget Responsibility predict tax revenues from duties will fall by £13bn a year, at current prices, by 2029, as cars become electrified and more fuel-efficient. Plugging the gap would require a 50% rise in fuel duty, according to the IFS. It recommends moving towards a nationwide system of road charging, including road tolls, to account for this loss of revenue. The IFS says a solution would be to charge drivers by the mile, with higher pricing in congested areas at peak times. Drivers in the countryside would be likely to pay less. "Such a move would generate substantial economic efficiency gains from reduced congestion, reduce the tax levied on the majority of miles driven, leave many (particularly rural) motorists better off, and provide a stable long-term footing for motoring taxes without necessarily raising net additional revenue from drivers," the IFS said. The IFS said that the current system of taxation on fuel "cannot vary according to time and location", and so is "fundamentally unable to account for" differences such as levels of congestion and demand. "Taxes on road use, however, would be able to do so," it said. The Treasury and Department for Transport are carrying out a feasibility study looking at "new ownership and financing models" for the roads, with the results due in the autumn. Prime Minister David Cameron, meanwhile, has suggested that private money be used to improve England's road network. The government is consulting on charging tolls to motorists, following on from the existing M6 toll road. It is also considering "shadow tolls" - a fee to the road maintenance company per driver using a road, but paid by the government rather than drivers. Under the plans, companies would lease motorways and trunk roads from the government, maintaining and perhaps improving them by adding lanes, for which - as long as they meet targets - they would be entitled to a share of road taxes. The construction of new roads could also be taken on by the private sector. An online petition against a national road pricing plan by the last Labour government secured two million signatures.